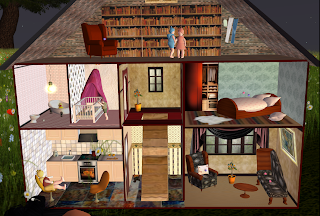 The other day I logged in to find my Second Life avatar, above, playing around in Third Life. Well, no, actually, what yours truly is playing with is just an amazing little creation by June Trenkins, a stunning wearable dollhouse—which is great because you can "wear" it anywhere, even in no-rez sims—that's for sale for only L$1 at Kattastrophe, a store in the sim Calypso that June shares with her friend Katta. 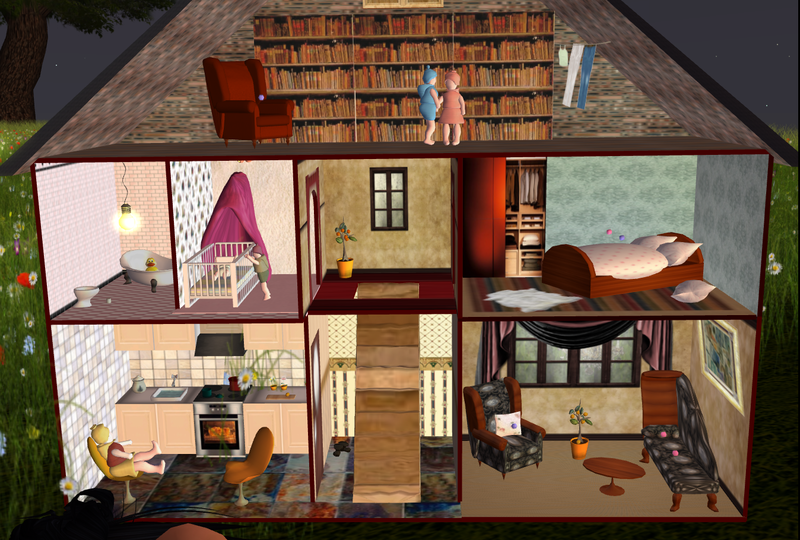 A 256 prim miniature build, the dollhouse includes dolls and even little poseballs (see the downstairs sofa and chair, the upstairs bed, and the chair in the upper library!). It's a terrific conversation piece, and comes with a children's version that gives you a sitting pose (doesn't work for large avatars, sorry), and also includes a doll ("real" sized) and a wearable swing. What more could you want for a buck? Plus, if you visit Kattastrophe you'll find a ton of other delightful and crazy items.